Breakfast time again! This week, meet Angela Dose — beadmaker, blogger, and mother of two. Angela’s exquisite glass beads are absolute gems. Just ask our own Kelly Warren — she uses Angela’s beads for her Happy Shack Designs. It’s not hard to see why! So, take a quick break from your last-minute holiday preparations, and enjoy. AD: Hello! I’m Angela Dose — wife, mom, dental assistant, glass beadmaker, and all around caretaker! 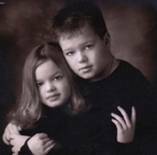 I have been married to my husband for 18 years and we are the proud parents to two wonderful children (son 14 and daughter 12) they are the light of our lives! CC: Tell us about your creative endeavors. 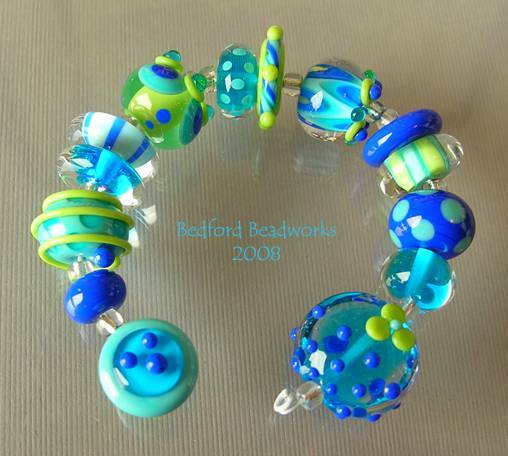 AD: I began making handmade glass (lampwork) beads in 2004. 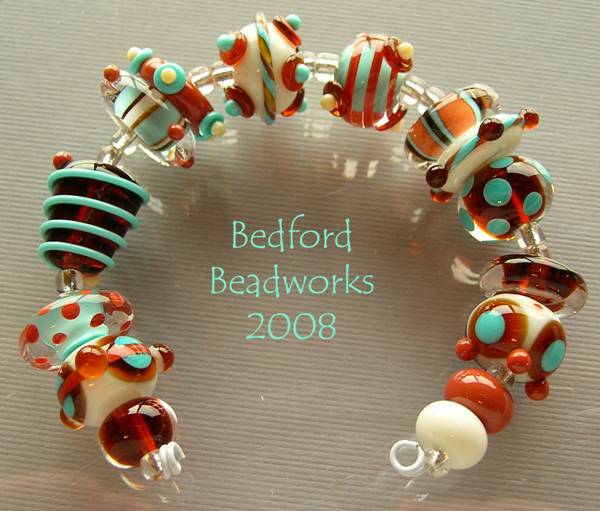 Originally I had a small, home-based artisan jewelry business, purchasing lampwork from other talented beadmakers on eBay. 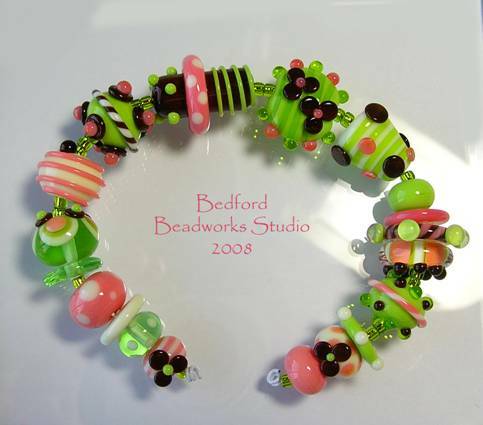 As time passed, I decided that if I knew how to make my own beads it would be a positive move for my business. Making my own beads would allow me complete control of the design process and I wouldn’t have to wait for someone else to think up the color combinations and shapes that I wanted to design with. Well….since I began making my own beads I haven’t designed or created a single piece of finished jewelry for sale yet! Glass is my passion! I opened my Etsy shop in March of this year, and I couldn’t be more pleased. 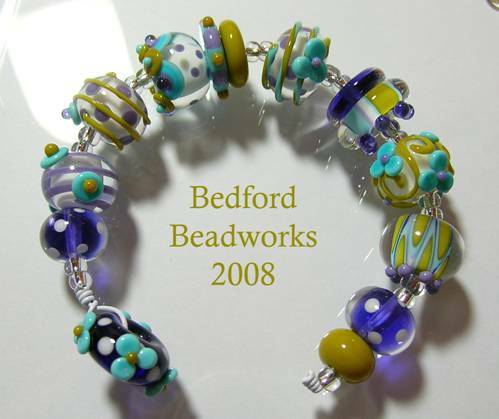 I mainly sell loose lampwork bead sets to other collectors and designers for use in their own creations. Let me tell you, there are so many wonderful, creative people out there who make fabulous handmade jewelry! I am so fortunate to have found this sales venue and these people! CC: What inspired you to start a blog? AD: In August of this year I reluctantly decided it was time to blog. Now…don’t get me wrong, I love blogs and blogging but it was a leap of faith for me as I usually like to fly under the social radar! After many years of working with my customers, and having them ask me “what I do” ~ “what I look like” ~ “what’s your studio like” ~ “how many kids do you have”…I figured it was time! I am glad to finally BE the face of my business, and I have been warmly welcomed! I look forward to sharing my goofy thoughts, hobbies and creations with my blog readers, I have met so many gracious, friendly people along the way and for them I am grateful as they continually amuse and inspire me both personally and creatively. CC: Do you feel that blogging keeps you creatively “accountable”? AD: I think my blog keeps me accountable by keeping me grounded. 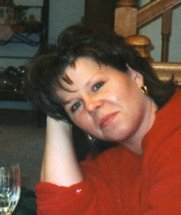 It has taken me a long time to actually feel like I have earned the title “artist.” When I sit down to blog it really reminds me that I am “me” ~ Angela ~ just Angela and not some hotshot beadmaker! 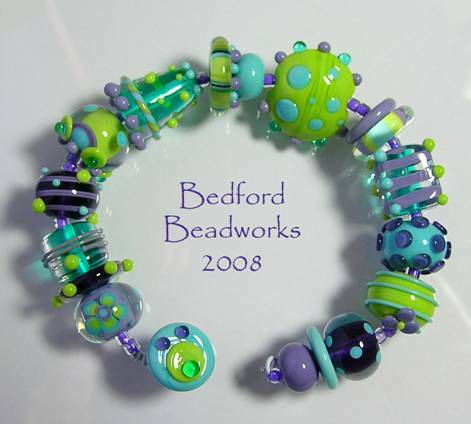 I just try to keep it real and blog about things other than beads too…my life is about so much more than just my glass! 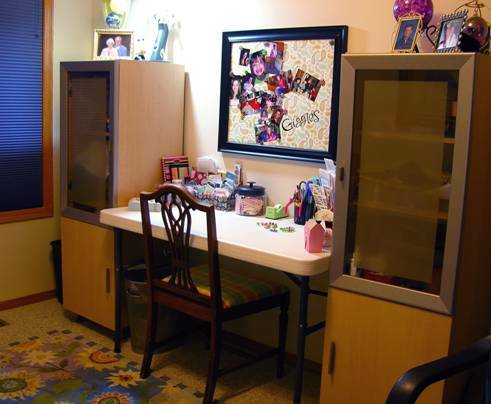 AD: Funny thing is…I had to bargain my studio space outta my husband. You see, it’s kinda hard to tell your husband the “firefighter” that you would like to steal a corner of his beloved woodshop to start a large fire and melt yourself some glass! Now wouldn’t that be a kick if you burnt down a firefighters garage! Yikes! Anyhoo, after much debate (ahem…more like begging!) 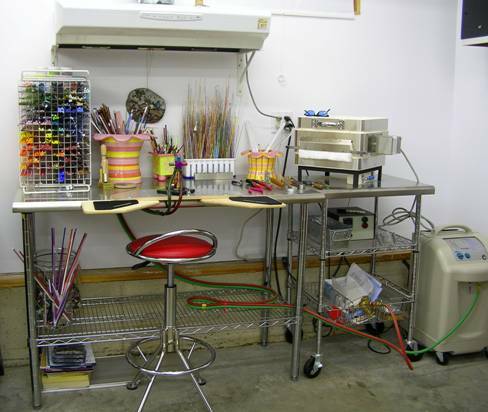 I had myself a space to call “my studio” and I was so pleased that my husband even helped me set it all up! Though, I’m sure it was “so it got done right enough” for him! Along with my studio space I have a small office where I take care of the nuts and bolts of my business…stringing, photographing, editing, listing, packaging, and mailing. I’m always accompanied there by our big fuzzy cat Ollie, he’s a great sidekick! Personal space…it’s a good thing! AD: By day, I’m a dental assistant in a fairly large, two-doctor practice. I count my blessings every day that my art has made it possible for me to work less at the office and still make a living while being there for my kids. A typical day when I’m not at the office involves getting the kids up, fed, and out the door to school. When that is accomplished that leaves me with about 5 good hours two days a week to create! My children have a fairly light activity schedule (compared to some kids around our neighborhood!) but I still manage to spend quite a few hours a week on the road being “taxi mom.” Not a big deal really, I’m just glad to be able to have that time with my kids. Sometimes the best design ideas come when I’m sitting in the school parking lot all alone in the quiet waiting for the kids. CC: Has motherhood changed you creatively? AD: I don’t think motherhood has significantly changed me creatively. I have always been allowed to express my artistic side with my family and they’re my biggest support system. Well…there it is in a nutshell and I didn’t even know it…motherhood has afforded me an awesome, unconditional, and steadfast support system! In all my hair-brained artistic endeavors my family is there to support and help me. Before I was a beadmaker I was a wedding cake designer with a home-based business. My kids could come within an inch of a huge cake and not disturb it one bit ~ then turn right around and help me deliver that mammoth creation like pros and they were still just young kids! Yep…they make me a better person, no doubt about that! AD: Well, I’d like to say that I don’t struggle with anything BUT…I know most of you out there are moms too! So, I guess I would have to say balance. There are days that beads come before dinner, dishes, or the vacuum! There are days that everyone else has to come before beads. There are days when I hate to tell anyone “no” whether it be my family or my clients. I’m such a “yes” person that sometimes I create my own misery, but I’m working on that one! I have to remember that I’m not a superwoman, and that’s okay…now just remember to remind me of that, would ya?! AD: I’m inspired by many things in regards to my art. Though I’m not a scrapbooker I have an enormous stash of beautiful paper. I LOVE paper! There are days that I can’t think of a color combo for beads to save my soul, so I dig out the old paper collection and bingo, it sparks something for me! Inspiration at its best! In addition to paper and color in general I would have to say that nature is another one of my major inspirations. I have a huge love affair with perennial flowers and bulbs. I have a blast getting in the dirt and planting, mostly because I can’t wait for the result! There is just something so magical about blooming plants; they are the most beautiful and delicate works of art ever! AD: Geeze Louise..let me think…hmmmm that’s a tough one! I read quite a few blogs but I would have to say that some of my favorites are Allsorts, The Glass Slipper — Sarah Hornik’s site — and Watch Me Create. AD: My greatest indulgences: new glass, Starbucks, and paper of course! AD: One word — TWILIGHT. I have totally been caught up in this book — I’m just finishing up the first one and have the second book on deck! It’s been a long time since I have sat down to read anything other than bead-related stuff…I’m enjoying it! CC: What advice would you give to other mothers struggling to be more creative? AD: My advice would be to get your family involved! My kids love to come into the studio with me and try out new color combos by pulling rods. Sometimes the most mundane days can be brightened by someone else’s creative point of view. Start up a new crafty project with your family — dishes and laundry can so totally wait. Making art and memories with the ones you love is priceless! angela, this is great! i’ve been fascinated by glassworks of all varieties for years, but just haven’t picked it up yet. your kitty and mine are ‘sisters of a different litter’! unless i missed something and yours is a boy…. glad to meet you! and see the source of kelly’s beads! yeah! so glad to finally see you here angela! Those beads are AMAZING! I love your attitude, too, in regards to working around/with your kids and letting them take your art in new directions. When I get upset because I can’t do much of anything creatively “just for me,” I will channel the amazing Angela & go with it! Thanks ladies, I’m honored to be featured in such great company! Kelly , thanks for giving me this opportunity…you’re just the best! 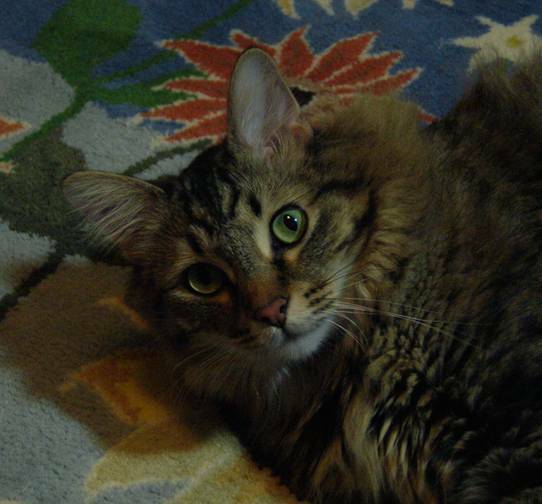 Cathy, yep my Ollie is a boy, but you never know…they may still be related!! LOL! Liz, thanks for your kind words, I figured I won’t get to keep those kids forever…. one day soon I won’t be “cool” enough to hang out with….so I better get them involved with my stuff while I can! Again, thanks to you all and have a Merry Christmas! Your pieces are so lovely, Angela! Thanks for sharing your words and photos! Than You Kate for your kind words! Have a Happy New Year! 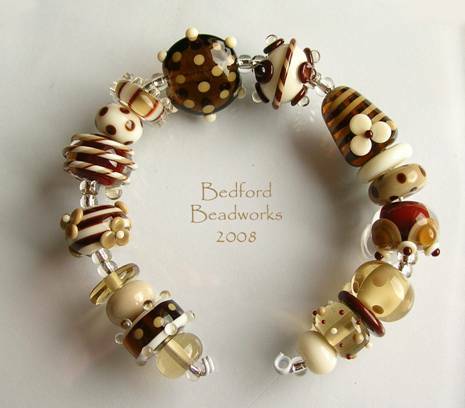 I love your lampwork beads. I have a new website and I am looking for different materials. I design more on the abstract side with mostly natural supplies. I saw that you do not have an etsy site anymore and was wanting to know were I can go to look and purchase your beads when they become available. As a stay home mom , I know how it is to balance both caring your family and running a business out of your home ,can be a big challenge . After 20 years in the medical field , I love to be creative . Please let me know how to purchase your beautiful beads.